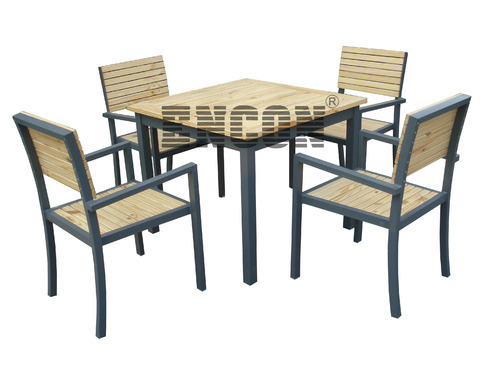 In order to maintain our goodwill among the precious clients, we are offering our clients a perfect range of Aluminum Wooden Outdoor Furniture. While designing and manufacturing this furniture, our experienced professionals use the optimum grade aluminum and wood along that are procured from the reliable vendors of the industry. To ensure its quality, it is duly checked on several parameters before the final dispatch. Furthermore, clients can get it from us at affordable prices. Incepted in the year 1995, in Gurgaon (Haryana, India), we "Encon", are the distinguished manufacturer, exporter and supplier of wide gamut of Tensile Structure, Gazebos, Umbrella, Outdoor Furniture Day Bed, Sofa Set, Indoor Tensile, Rolling Blinds, Dining Set, Mix and Match, Bar Sets, etc. The offered products are widely used outdoor places for different purposes. Our offered products are manufactured using optimum grade hard wearing material and cutting-edge techniques in adherence to set industry norms. We offer these products to our clients in different sizes, shapes, models and dimensions to meet vast necessities of our clients in specified manner. Our offered products are widely known for their enormous features like sturdiness, crack resistance, easy to maintain, water resistance, abrasion resistance, durability, unmatched quality and heat resistance. To provide these products at our user’s end in safe manner, we pack them using robust packaging material.